My favorite part about Wasabi (downtown and east – I’ve been to both) is their greeting when you walk in the door. I know they say it to everyone, but it’s like you’re Norm, arriving at Cheers. And isn’t that everyone’s dream? OK, just mine? Alright, moving on. They have a good selection at the downtown location. I had a hard time deciding what I wanted. In fact, sometimes I feel like there should just be a checklist for making sushi. I’m sure there is somewhere, maybe even at Wasabi. Build your own. Choose your fish, fillings, wrapping, and fried or not. Of course, if I did that, I never would have tried the roll I got. I think it was called the Love Roll? I might be wrong on that name. But all I know is it had strawberries on it. I know, I know. Gross, right? It had crab, spicy tuna, avocado and strawberries. I like fruit and avocado, so that wasn’t a stretch. And even adding crab wasn’t a stretch. But the spicy tuna? Seemed weird. I asked the waitress and she said I’d love it. So I got it. And she was right! 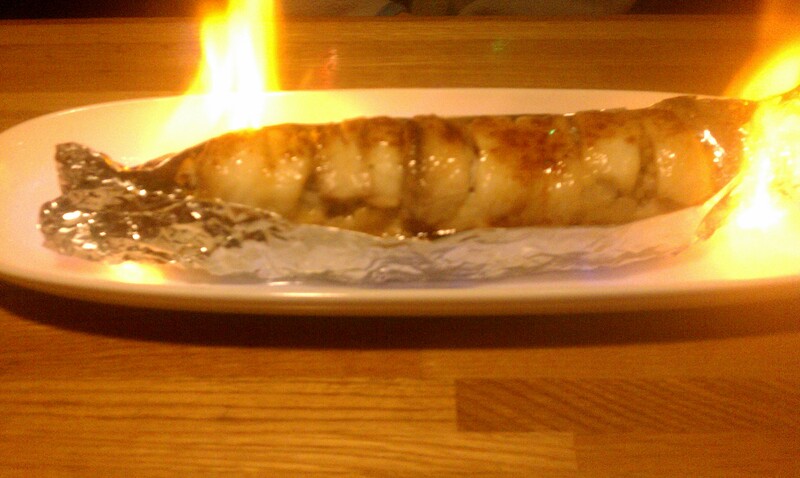 Lyndsey got a roll that came out on fire. Points for presentation. Not as many points for the roll holding up. She had to eat it with a fork. But she said the sauce was delicious. I think it was the Red Dragon Roll, with spicy tuna, cream cheese, avocado and red snapper on top. Anyway, she loved it. A+ scores all around! Everybody clap for Wasabi in Old Town. Now, let’s talk about Wasabi out east (32nd and Rock). I went there once on my lunch. The restaurant still had the same vibe, good service, and a decent menu. BUT, the menu isn’t the same as the Old Town restaurant. I found this a little disheartening. Mostly because I’ve been dreaming of the Love Roll almost every second since I had it. No, seriously. The thing will randomly pop into my head, but I don’t have easy access to Old Town. I’d heard the east location wasn’t as good, so I was avoiding it. And when I walked in and tried to order, was told the menu wasn’t the same. Sigh. Slight letdown. Since I was emotionally incapable of recovering, I let the waiter pick my roll. He picked a roll that was deep-fried, which I normally avoid. Not for lack of deliciousness, because let’s face it: YUM. But just because I try to go a little healthier on the ole ticker. But nonetheless, that’s what he picked, and I didn’t realize it was fried until I got the roll. I think it had crab, cream cheese, avocado and shrimp in it. And it did have rice, and then was battered and fried. And it came with a sauce on the side (that I assume would have been drizzled on the top in the restaurant). It. Was. Delicious! So, while I think many patrons who have been to Old Town then go east (or vice versa) might be disappointed to know the menus are different, especially since the sign at the east one alludes they’re the same restaurant since “Old Town” is in the sign’s name. I suspect this will only happen, though, if they’re craving an item off of the other store’s menu. If I hadn’t had that Love Roll, and weren’t craving it, I probably wouldn’t have even noticed the menus were different. I definitely say go. I also really liked Kanai the one time I went, as well as Sakura and Sumo the couple of times I’ve been. Even Bonefish makes good sushi. And before anyone says bigger cities or coast cities have better sushi and to not waste your time getting it in Wichita, please don’t. I don’t mind if you think it’s better somewhere else. But don’t let that sway others from visiting when they get the urge. Plus, I actually LIKE living in Wichita, and appreciate having a variety of sushi options with such great service. If Wichita sushi doesn’t do it for you unless you’re in a coast town or some other big city, that’s fine. There’s nothing wrong with saving sushi for when you travel. I love getting seafood when I travel, too. Now, anyone out there who can tell me what they say when you walk into Wasabi? I assume it’s Japanese. I want to yell it at anyone who comes in my door! Ooooooohhhhh.. Ahhhhhhhh… Fire rules. Lyndsey’s Roll. Possibly the Red Dragon Roll. And the Love Roll. God, I miss it.